I was excited to learn a few months ago that my friend Morgan from college was working as a ranger at Carlsbad Caverns for the summer. I was equally disappointed to hear the the two nights I would be there were during her weekend, and she was planning on going camping in the mountains (she’s not used to the desert, so she needs to escape towards trees and/or water whenever she can). I was bummed about missing her, but Morgan confirmed with her roommate that it was alright for me to sleep on their couch anyway. 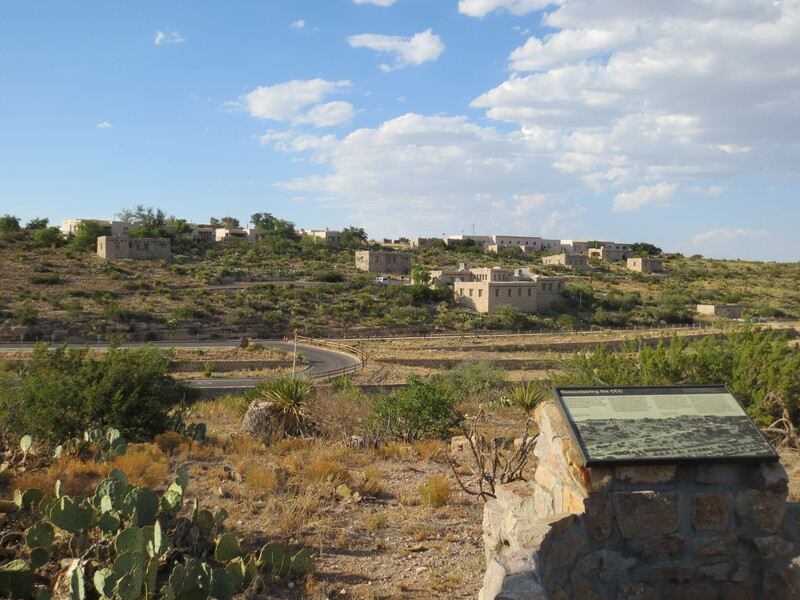 As summer rangers they get to stay in the park itself, right across from the Visitor’s Center in tiny, old, stone houses. I followed Morgan’s directions to get to the staff parking lot, and wandered around the tiny houses and apartments until I found her house. I knocked on the door but no one answered. I wasn’t sure what I would do if her roommate wasn’t home, since I had no way to contact her and Morgan was probably out of cell range by now. I knocked again and looked around. Eventually a woman came to the door, and I began to explain myself. Her name was Mary Ann, and she seemed completely unconcerned with me or my presence there. Mary Ann left to visit some friends in a neighboring house, and I went over to the Visitor’s Center to watch the Bat Flight. 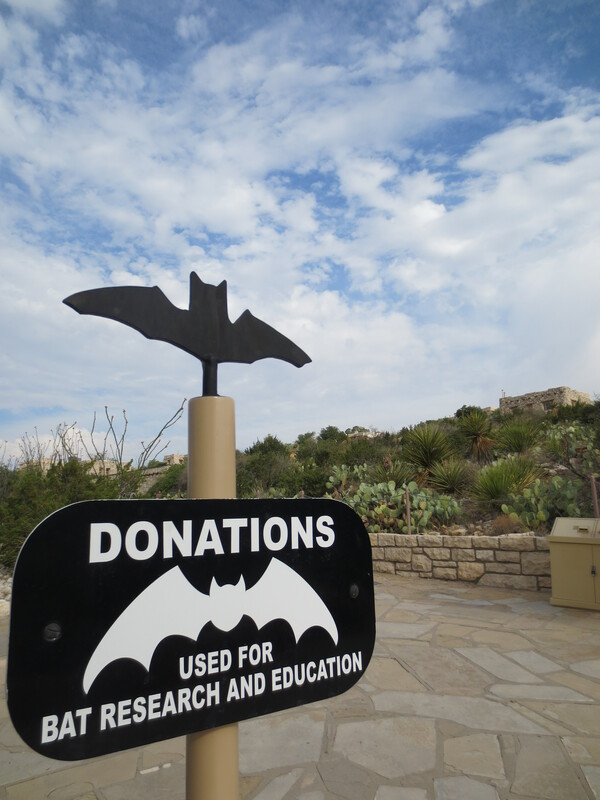 During the summer months the Mexican free-tailed bats migrate up to Carlsbad to live in the caves. The section where they nest is closed off to visitors, but you can catch a peek at them every night as they exit the cave for their feeding session. The start time is approximate of course. If the bats come out early you’ll see a lot of them. If they come out late it may be too dark to see anything. 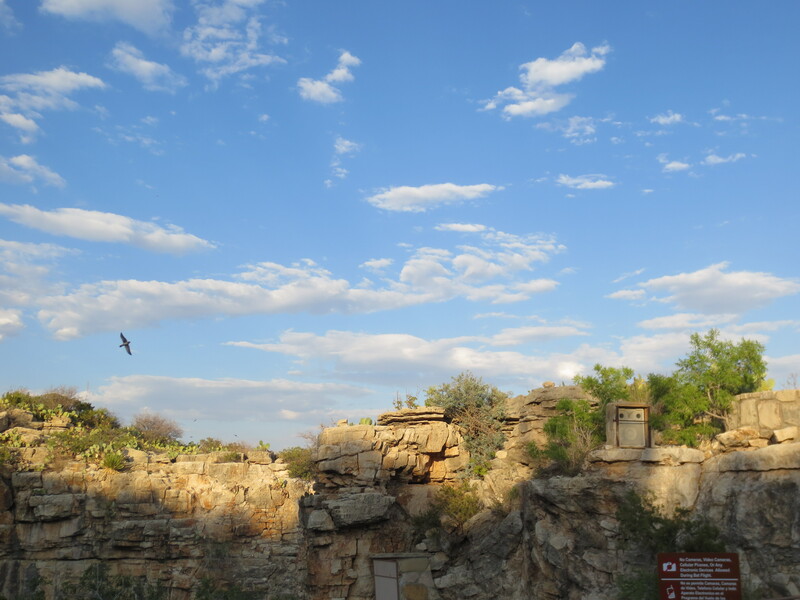 An open amphitheater is situated above the natural cave entrance, and while you wait a park ranger gives a talk about bats. I got a good seat near the front and waited for the talk to begin. I saw a young boy walk by wearing a Batman cape. There was a family behind me with a 4-year-old boy who was simply not understanding the concept. “Where are the bats?” he would ask. “They’ll come out once the sun sets,” his mother told him. On and on like this, until the ranger came forward to give the presentation. No cameras are allowed during the bat flight because the flash and electronic noise interferes with the flight. An enforcement ranger stands near the front, scanning the crowd to make sure no one is trying to sneak a photo. We learn about the bats, their migration, their diet, and a fungus that has been destroying bat colonies out east but fortunately hasn’t reached Carlsbad. A sensor is set up deep in the caverns near the entrance to the bat cave itself. When the bats begin to move, a scratching, clicking sound can be heard over the speakers. After a few clicks the ranger declares that it’s time, and he turns off his radio and speaker system to ensure they won’t bother the bats. The first few minutes are awkward. We are told to be very quiet and move as little as possible. But the bats aren’t there yet. So we sit in still silence, staring up of the New Mexico sky waiting for them to appear. No one in the crowd knows how long we’ll have to wait. There are lots of kids, and kids are hard to keep quiet, especially without payoff. Parents keep shushing them and getting them to sit back down. The kids keep spotting cave swallows and asking if they are bats. They’re not. There are no bats. Eventually, I see the ranger point up to the sky. It’s dusk now and it’s hard to tell the difference between a bat and a bird in such low light. He points again, and I see it this time. Gradually, more and more appear from the cave, and I’m getting better at recognizing them. They fly up, filling the sky. Like all exciting things, after a while the wonder begins to wear off. The younger children become restless, and the families leave. It’s getting darker, and it’s harder to see. I keep watching the bats until I am the last person in the amphitheater. I decide it’s time to go, not wanting to hold up the rangers since I’m sure their shift only ends once all the tourists leave. As I walk out I overhear the ranger who gave the talk telling the others that it was the best bat flight he’d seen in weeks. He said at one point he was counting about 40 bats per second. How he could count them I’ll never know. 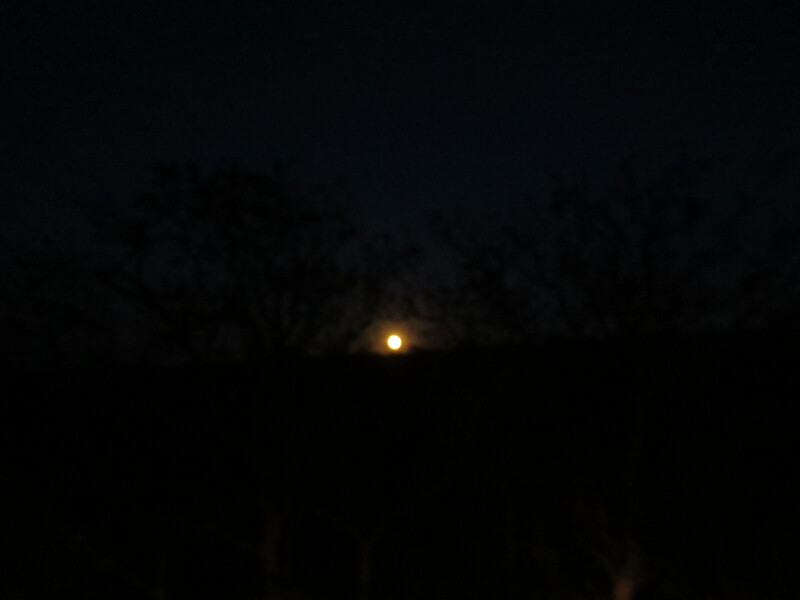 I walk back to my car, and a giant yellow moon is rising above the horizon. It’s the supermoon, appearing especially big and especially yellow. It’s gorgeous, but disappointing. I love looking up at the stars, and the desert is the perfect place to see them. But with a moon this big and bright, there are no stars. I’ll have to check the lunar schedule next time I come to visit. I sneak back into the dark house as quietly as I can, trying not to wake Mary Ann. I slowly get ready for bed, and after about 15 minutes Mary Ann walks in the door, having only just returned from her friend’s house. Once again, she is generally unconcerned with me. The next morning I wake up early so I can get to the cave entrance right as it opens. 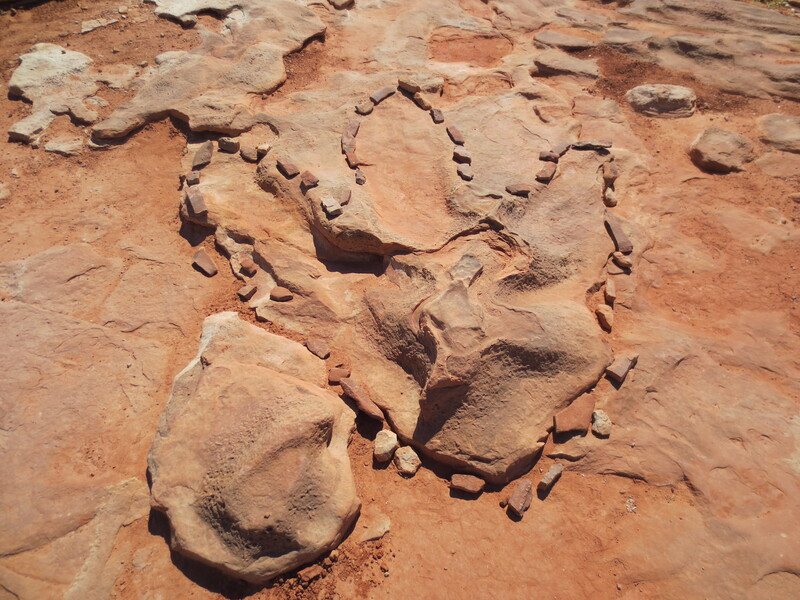 Since very early on in the cave’s explorative history people have reached it vertically. Originally it was by a large guano bucket lowered down by ropes. In 1932 an elevator shaft was constructed, and people have been going in and out by elevator ever since. There is still a large, natural entrance, however, and tourists can walk all the way down themselves if they so desire. Morgan left me a note suggesting that I walk down the natural entrance rather than take the elevator, so that was the plan. There are many warnings about the difficult climb, and how it’s not for everyone. After looking at the specs for temperature, distance, and depth I felt pretty confident. Compared to the Grand Canyon, this would be easy. The cavern system is separated out into different areas. The natural entrance and the Big Room can be seen by anyone via self-guided tour. 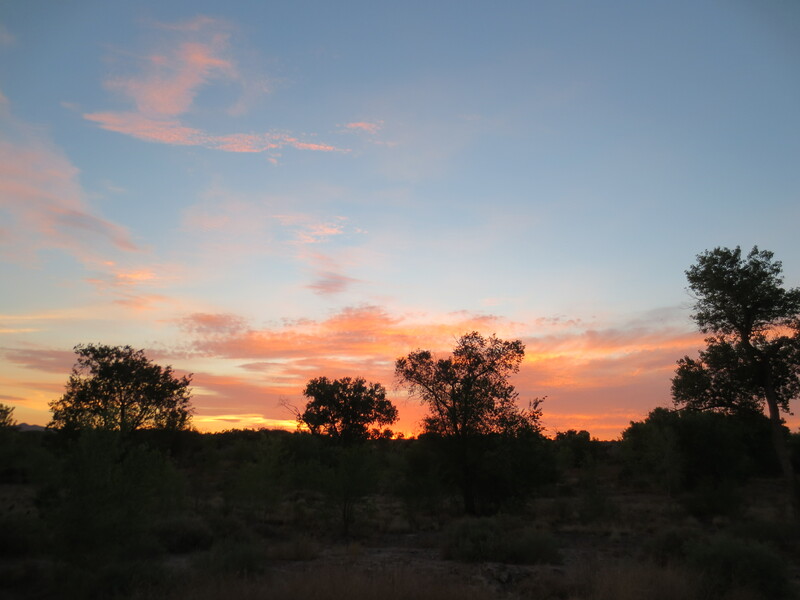 Other areas are only available in small, ranger-guided tours. Some require special equipment and physical ability. Those tours also require reservations months in advance, so I opted for the only guided tour available, the King’s Palace. The cavern is a cool 68 degrees at all time. It’s lit by specially placed lights, designed by a broadway lighting designer. The King’s Palace is a series of rooms near the base of the natural entrance, and the ranger took us through, pointing out the various features and telling us more about the cave’s human history. After guano mining proved less profitable than originally hoped, the caverns become an attractive tourist location. People would be lowered down in the guano bucket and led through by torchlight. The caves are massive and complicated, and it’s hard to imagine navigating them by nothing but memory and the occasional marker. Back in the 1940s, the most well-known and well-liked of the guides used to lead what he called the Rock of Ages Tour. He would take huge groups into the Big Room, sit them down in front of a formation called the Rock of Ages, turn off all the lights, and give a lengthy speech in the pitch black. As his speech was ending, a quartet of rangers would start singing the hymn “Rock of Ages” in harmony. Much to the disappointment of many visitors, they stopped doing those tours long ago. It was no longer practical to turn off all the lights at once, and I get the feeling the Park Service wasn’t thrilled about singing a church hymn during an official tour. 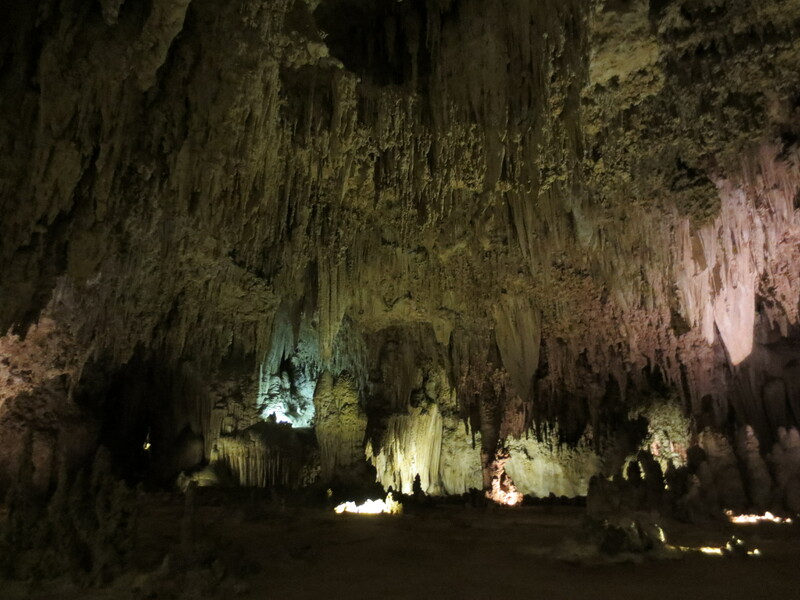 However, during the King’s Palace tour your group is in an area isolated from the main part of the cave. After going through most of the rooms, the ranger had us all sit down on the long bench lining the pathway. She went over to the switches and turned out the lights. I have never experienced that level of black. It’s hard to think about even now, because a total lack of light is so foreign to my general life experience. But in that room you are under several stories of solid rock, and without the electric lights there is absolutely nothing. I waved my hand in front of my face. Nothing. Sometimes I thought I could see it, but it was just my brain trying to make an image of something it was sure was there. In the darkness, the ranger told us about the speeches that were made during the old Rock of Ages tour. How he would explain to the dark crowd that, “for hundreds of thousands of years the cave sat in total darkness, her beauty completely hidden from the outside world. That beauty was first revealed when man brought in a single spark of light.” With that, the ranger clicked on a lighter in front of her face. Behind her you could barely make out a few of the formations – the same formations that were so clear a minute earlier under the electric lights. It’s amazing to think of climbing through this place, only able to see a few feet in front of you at any time. How absolutely terrifying and wondrous. It must have felt impossible. After the King’s Palace I walked through the Big Room, which is aptly named. I listened as the audio guide explained the various formations and the difficult preservation efforts (preserving the cave from thousands of annual tourists, since left to it’s own devices the cave would be just fine). The narrator explained that many features were named by whatever feature they seemed to look like, be it a lion or a fairy. The audio guide encouraged me to look for shapes myself and see if I could come up with my own names. 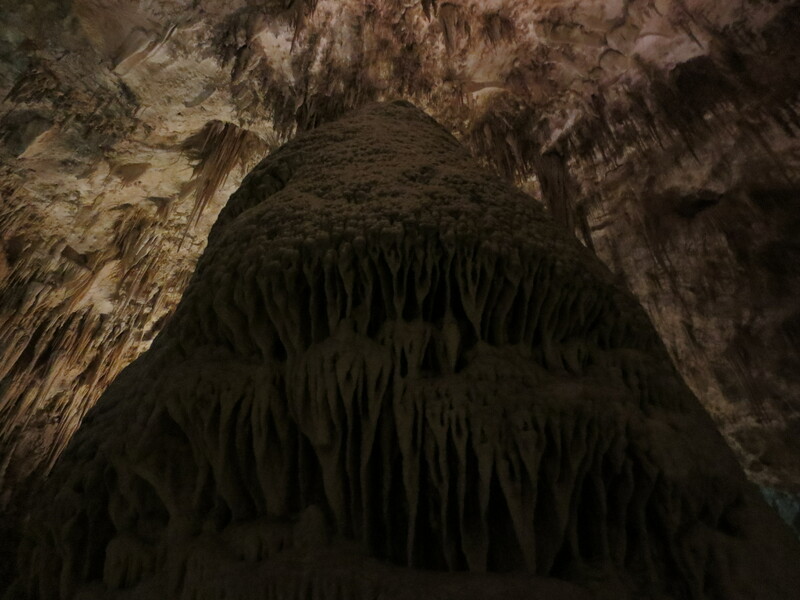 Around the next corner was, of course, a stalagmite that was unmistakably breast-shaped. It was hard not to giggle. The lighting in the cave can make for some dark and blurry photos, but I did my best. After I walked the length of the Big Boom I took the elevator up for lunch. I saw that there was a ranger talked scheduled for 4PM down in the Big Room, and rushed back down in time to catch it. Between the ranger talk the day before, the bat flight, the audio guide, and the info panels, I had already heard most of the information in this talk. He did relate the wonderful story of how they used a balloon to hook a rope to the ceiling to explore what turned out to be a large room directly above the center of the Big Room. When trying to imagine this event, remember that the ceiling in the Big Room is 255 feet (78 meters) high. The cave was closing for the day, and I caught one more talk about Mountain Lions before I headed back to the little stone house. I walked in the door to find my friend Morgan sitting in the living room with about seven other people, all eating German chocolate cake. We hugged and she explained that after the first night, she’d seen enough trees and was frankly a little bored. So she came back early, knowing I would be there. And she made a cake, because it’s Morgan. The crowd in the living room was composed of other rangers, and after a while everyone left but Morgan, Mary Ann, and myself. Morgan explained that she’d made a homemade face mask that her and Mary Ann were going to use, and asked if I wanted to try it. We slathered it on our faces and went to sit on the stone porch wall to let it dry. I asked what the mask was made of, and Morgan said it was yogurt and turmeric. Knowing the effect turmeric has had on some of my other possessions I asked, “Doesn’t that turn your skin yellow?” Morgan shrugged, “I don’t know, mine doesn’t turn yellow.” Mary Ann’s eyes got wide and she ran back inside to wash it off. I figured it was too late for me, and Morgan and I turned back to face the visitor’s center. From her house you can see the path tourists take to get to the amphitheater for the bat flight, and we watched as the nightly procession began. After the mask (which did not turn my face yellow), we walked over to their friend Tess’s house for a party. I get the impression this is an almost nightly occurrence, and probably where Mary Ann had been the night before. This explained a lot about her previous lack of acknowledgment, since she was a normally fun and friendly person. When the party calls, nothing else matters. Tess made Mac & Cheese, and much alcohol was consumed. The rangers are fun and sometimes wild people, and I felt at home with them instantly. 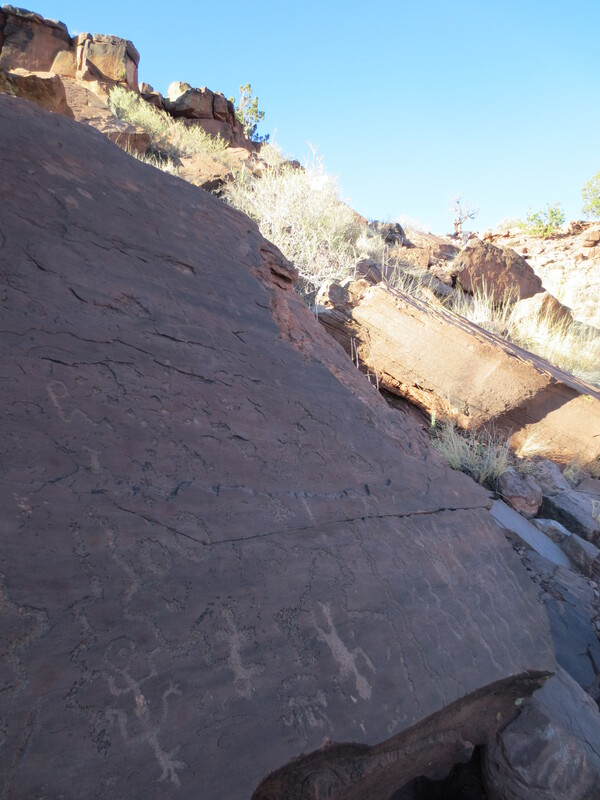 I mentioned that the audio guide told me to think up names right before I saw a rock shaped like a breast, and the others explained that formation was called the Breast of Venus. This was immediately followed by the question, “But did you see the Rest of Venus?” Apparently there was a vaginally-shapped formation near the end of the Big Room, and Morgan promised to take me to see it the next morning before I left. We stayed late into the evening before heading back to our own tiny house for the night. You have to carry flashlights when walking at night because of the presence of snakes and spiders. It was clear that someone had not taken that precaution the night before, as evidenced by a large, squashed tarantula on the path. The spider was named Dead Tom and Mary Ann worried she was the culprit. In the morning we got up early for what became known as Genital Tour 2013, where Morgan took me on a quick tour of her favorite formations shaped like private parts, starting with the Rest of Venus. Morgan was off-duty but she still had her keys, so the two of us went back into the King’s Palace area for a few extra special phalluses. On our way out we heard some tourists coming down the natural entrance path and ducked behind a rock to avoid the awkward question of why two women in plain clothes were coming out of a gated area of the cave. Once we were done with Genital Tour 2013, we got in line to take the elevator back up. Of course all the other employees know Morgan, and as a result one of the elevator operator rangers offered to show us a few things even Morgan hadn’t seen yet. 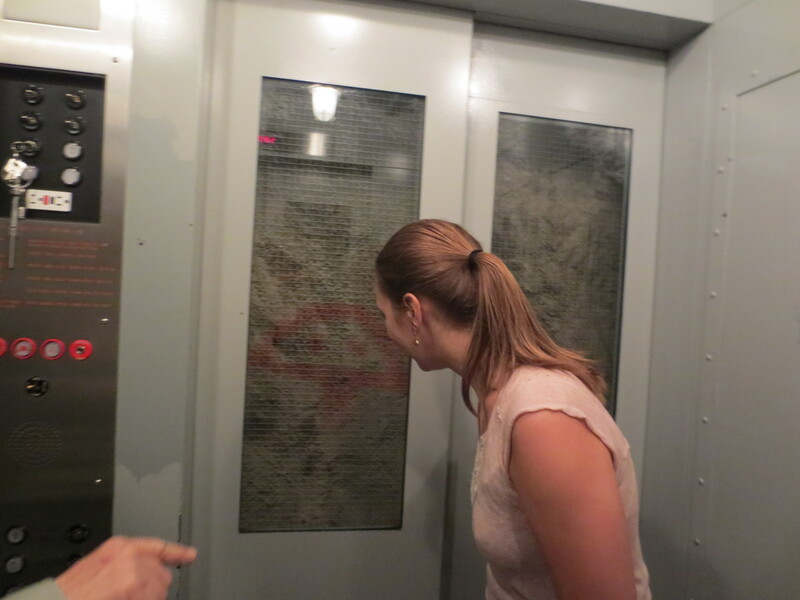 The elevators have large, glass windows to allows visitors to see the decades-old elevator shaft, cut from the stone. After letting out the other tourists that rode up with us, the operator closed the doors and took us back down several floors. He slowed the elevator to a stop and gradually raised it up again, until a bit of red paint caught his eye. He stopped the elevator and we looked out to see the image of Kilroy painted on the wall. He wasn’t sure how long it had been there, but since Kilroy’s heyday was World War II, it had probably been a while. He raised it up a bit more to show the way they cut small channels in the rock to drain water out, and a bit further to see some tiny stalactites forming on some of the support beams. It was funny to think about the thousands of people that look out these windows everyday, but are moving too fast to really see anything. If you are reading this it means I am in the middle of a wi-fi desert on the Blue Ridge Parkway and am not able to upload the next post. Blogging will continue once I reach civilization and/or Charlottesville. 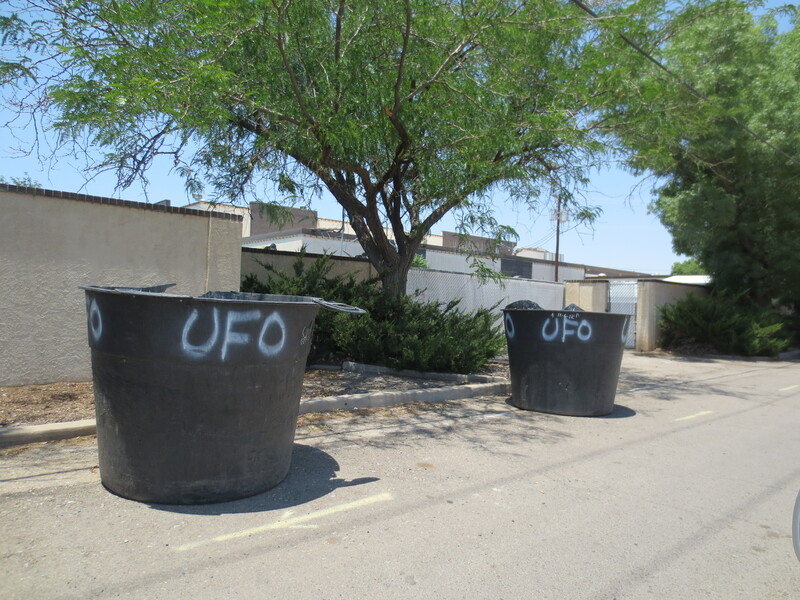 As a lifelong X-Files fan and space-lover, I couldn’t wander through New Mexico without a stop in Roswell. I had heard mixed things about the town. Some said it was cool and different, others said it was a kitschy waste of time. I feel like all the descriptions were accurate. 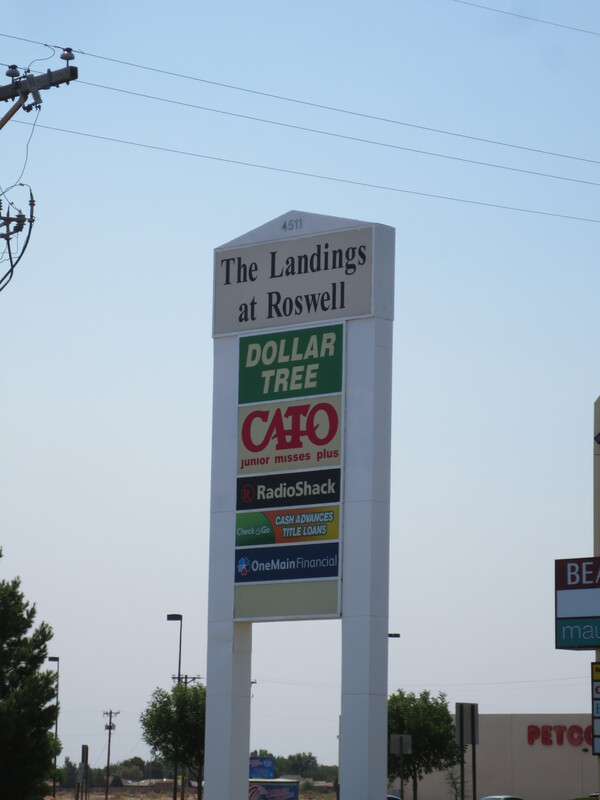 Without a doubt, the town of Roswell has embraced its alien legacy. Billboards for various businesses have pictures of cartoon aliens and claim prices to be “out of this world.” A single block of Main Street seems to hold all the main tourist attractions, including the International UFO Museum. Of course, the museum has no real artifacts to speak of, since such things would be, you know, evidence of extraterrestrial life. It does have an impressive collection of newspaper reports, photos, and first person accounts from the crash in 1947. The official word from the US Air Force is that the object that crashed was a weather balloon, which was all anyone thought for some time. It was years after the actual event that accounts began to spring up that called into question the government explanation for the crash. For one, many supposedly firsthand accounts claim to have seen strange, dead bodies inside the crashed object. I am not inclined to believe an alien race that just happened to form in a remarkably similar humanoid shape developed spacefaring technology only to fly a single, tiny ship to our planet with zero followup. Nor am I of the opinion that the government is involved in a massive conspiracy to hide continued visits from such creatures. However in reading the accounts from Roswell, noting that they come from a wide variety of sources (from the backwoods farmer to the military nurse), it’s hard not to believe something strange went down in the desert in the 1940s. Personally the most logical explanation I’ve ever heard came out recently in a book by reporter Annie Jacobsen, whose anonymous source claims the crash was a soviet craft piloted by surgically-altered humans, possibly children. Her source also claims that the reason the military chose to hide this information was that our government, in response, decided to engage in similar experiments. Some of the source’s story is a bit much for me, but the basic principle seems sound: the crash was a result of military technology being developed in the Cold War. The event was kept secret because of ongoing experiments the government did not want known to the public. I imagine a similar explanation could be applied to any number of other, less notable events in the 20th century. 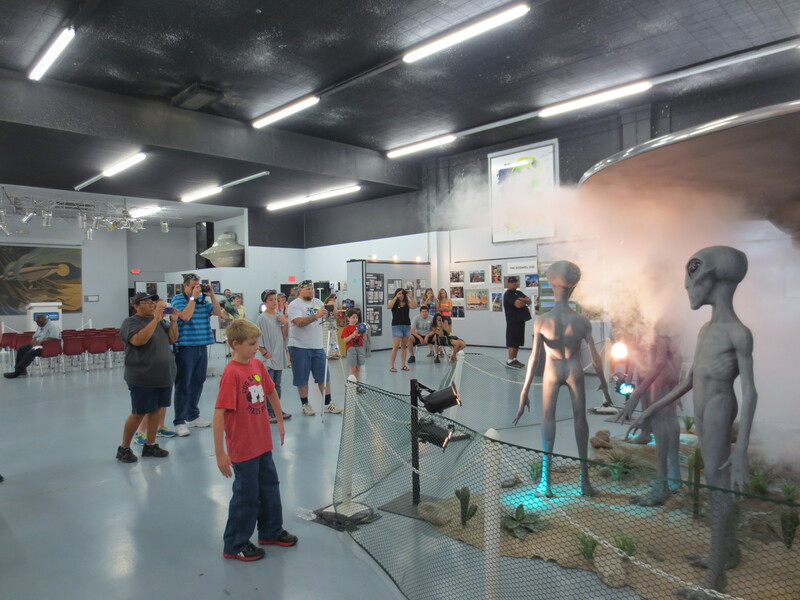 None of this changes the fact that the signature piece in the International UFO Museum is a full-size diorama depicting a flying saucer and four aliens. Every 10-15 minutes the saucer spins in mid-air, smoke appears, and the aliens move their heads back and forth while the sound of an incomprehensible, high-pitched, beep-based alien language is heard. Of course even taking all accounts at face value this is ludicrous, since everyone who claims to have seen the bodies agrees they were dead on or before impact. Still, the kids seemed to enjoy it. I looked around outside the museum, but all the other businesses seemed to be interested only in selling me cheap things I don’t want. These cheap things have aliens on them, which is what distinguishes Roswell from other tourist areas, but my needs had not changed. I bought a shot glass for my collection and headed over to the visitor’s center for recommendations on how to spend the next couple hours. I was told that the “best restaurant in town” was Margarita’s, the Mexican and Chinese buffet. The food was good, and I could see looking at the other customers that this place was popular among locals, not tourists. It also seemed to be popular among hispanics, which is usually a good quality in a Mexican restaurant. After lunch I headed to the Roswell Museum & Art Center. They have a sizable exhibit on Robert Goddard, the American physicist and inventor credited with building the world’s first successful liquid-fuel rocket. I think I had heard of Goddard before, and probably seen his name adorning buildings or star systems. I loved the exhibit. 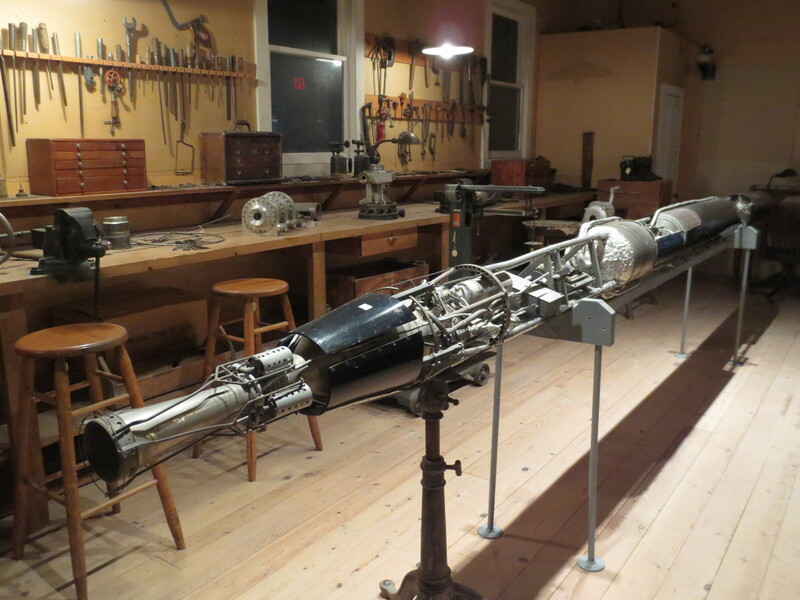 In contrast to the UFO Museum where there are no actual artifacts and everything is speculation, the Goddard exhibit was filled with original pieces from his workshop and experiments. These were real remnants of our first journeys towards space. A year ago we used a hovering crane to land a robot on Mars, and here in front of me were the now antiquated tools used to start the process less than 90 years ago. Some of the pieces seemed so strange, like they came out of a Dr. Seuss book on machines. Or a 1950s B-Movie. Or a medieval torture chamber. There were fragments from that first flight in 1926, and various trial versions of the rocket components. I watched a documentary showing footage from some of the first flights. It’s amazing to think how many hours of work had to go into getting such a small piece of metal to fly just a little ways up into the air. But it would have all been worth it just to have done it. We are so used to the concept of flight and even space travel, it’s hard to imagine what it was like to live in a world where 50 feet in the air might as well be the moon. Outside the museum a couple stopped to talk with me after noticing my Washington license plate. They were traveling as well, and after I explained my trip they asked where I was headed next. 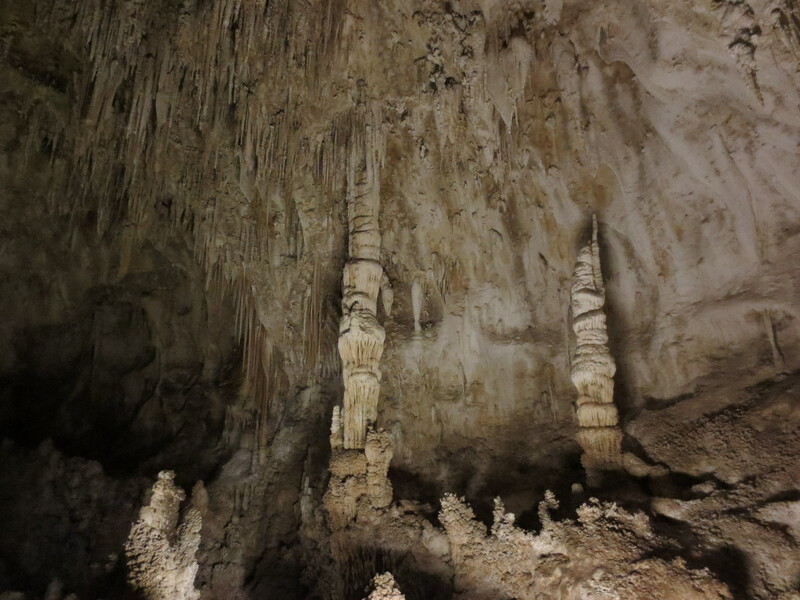 I told them Carlsbad Caverns, which was apparently where they were headed as well. “Maybe we’ll see you there,” said the man. Maybe, I thought. It would seem that stranger things have happened. In case you aren’t already aware, if you’re in a musical set in New York City, you are probably wishing you were in Santa Fe. For example: In Rent, the young artists talk about leaving behind their beautifully tragic bohemian lifestyles and opening a restaurant in Santa Fe. Rather than being in cold, harsh New York, they will escape to an easy existence in the sunshine. They won’t have to discuss philosophy and there will be no cockroaches. They will finally be able have a stable income, living the simple life. In Newsies, 17-year-old Jack Kelly envisions a land of cowboys, full of fresh air. 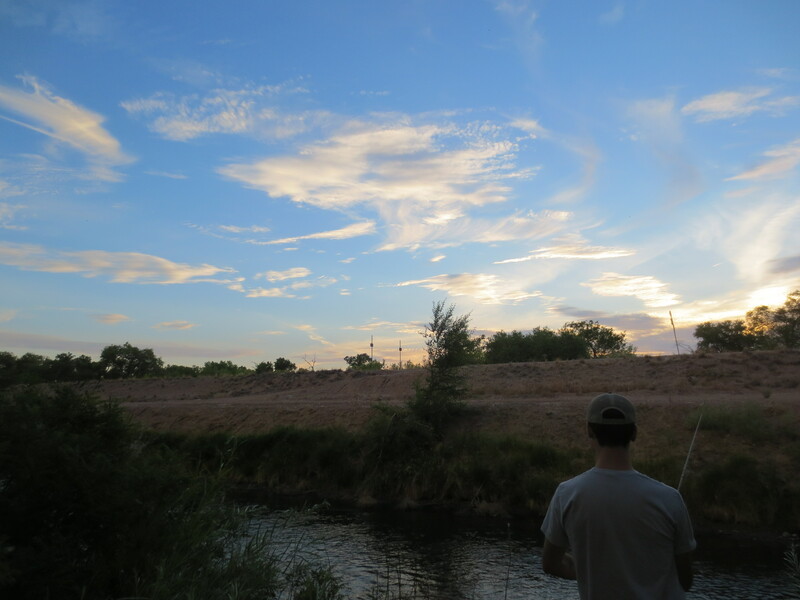 Far from the hustle and bustle of the newspaper-driven world he lives in, Santa Fe has freedom. He doesn’t need a real family, he’s got Santa Fe. It was because of these stories that Santa Fe was originally on my must-see list. I had to know what was so great. 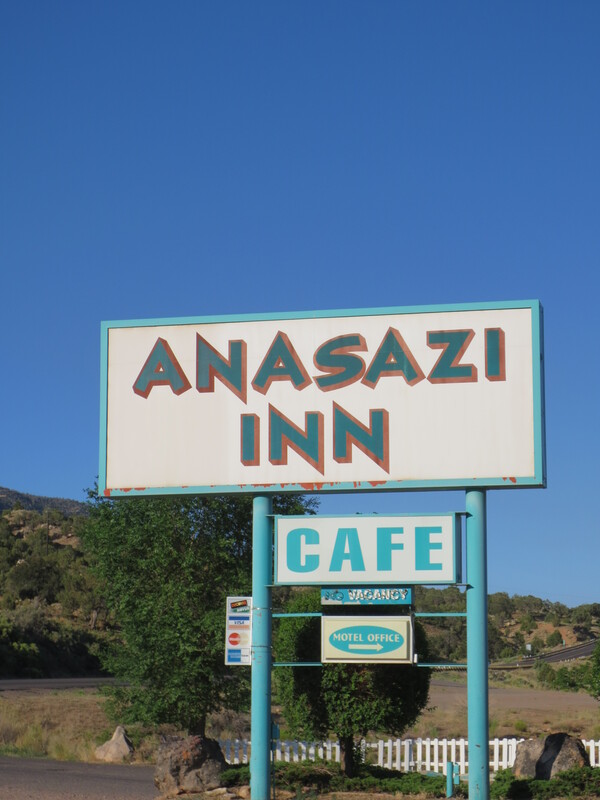 But the more I talked to people who had been to New Mexico, the more I heard the cities weren’t much to write home about, and all very similar to boot. At one point I was specifically told I could skip Santa Fe and just visit Old Town Albuquerque to get the same feel. My host in Albuquerque, a New Mexican native, generally agreed with this assessment. 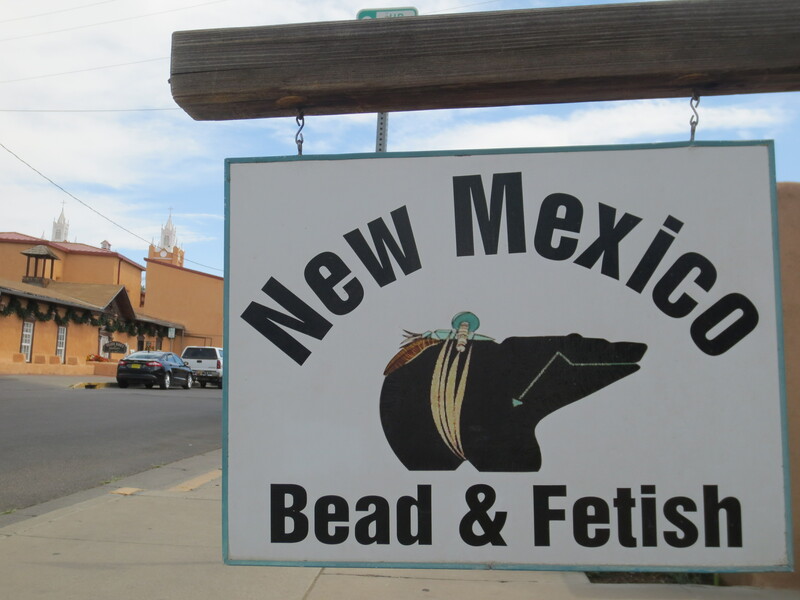 And I started to realize, all those people that sang about Santa Fe had never actually been to Santa Fe. All of those characters were born and raised in New York City and, spoiler alert, none of them go to Santa Fe in the end. The dream of Santa Fe is just that, a dream. I’ve never been to Santa Fe. But if I were to make a guess, I’d say it’s probably very hot and dry. I’d say there are a lot of touristy shops, and some very old mission churches. I’d say it’s dusty, and if Albuquerque is any indication, they still have cockroaches. But as long as you don’t go to Santa Fe, as long as it’s still your dream, then the show isn’t over. You still have a happy ending waiting for you, or at least a bittersweet but hopeful one. With that and a two hour detour in mind, I opted not to go to Santa Fe myself. This whole trip is a dream made into a reality, but perhaps some things are better left dreams. One of my favorite movies of all time is Contact. If you haven’t seen it, you should probably stop whatever you’re doing to watch it right now. Featured heavily in the movie is the Very Large Array in New Mexico, a series of giant radio telescopes used for astronomical observation. A normal telescope dish functions a bit like holding a funnel out in the rain – you can cover a larger area and still have everything funneled into a single spot so it can be useful. A radio telescope does this with radio waves, and the bigger the telescope the more you can “see” with it. 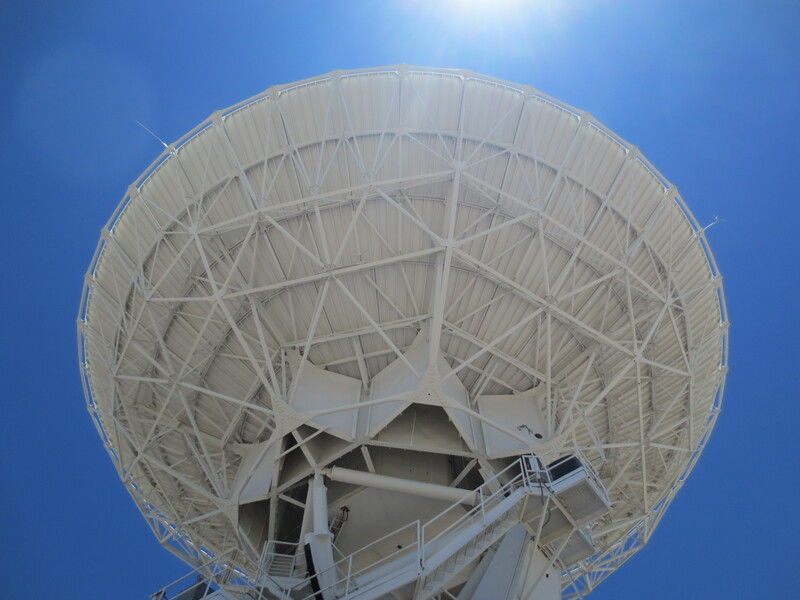 Of course there are practical and physical limits to how big we can build a telescope dish. What’s cool is that if you make several dishes and spread them out, they act like one giant dish that is as big as the area between the individual dishes. That’s what is happening at the Very Large Array. The VLA is very purposely out in the middle of nowhere. There are no pesky cities near the Plains of San Agustin to send out contaminating radio waves, and the high desert plateau is good for getting clear and consistent signals from space. I first saw the VLA from a distance, and thought I must have read the milage wrong before I left the gas station at a nearby town. I thought for sure I had several more miles to go. I did. 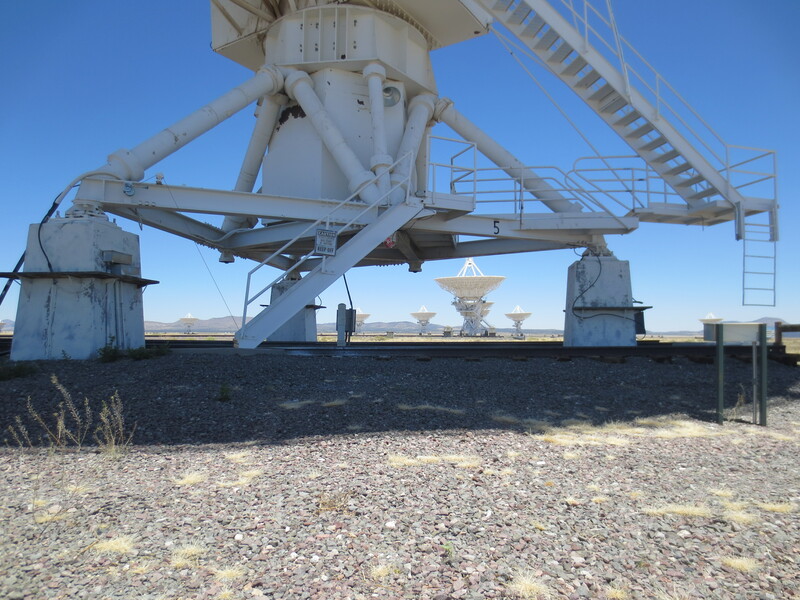 The VLA has 27 antennas, each spanning 25 meters (82 feet) and weighing over 200 tons. I was still 20 miles away when I first saw the antennas. They are that huge, and (at times) that spread out. I watched the video and took the walking tour, and was once again reminded how much I love space. I even learned a few fun facts relating to the Movie Contact, including that the canyon featured in the movie as being close to the VLA is Canyon de Chelly, where I had been just a day before. On the walking tour I took a few pictures, including another in my series of photos of tourists taking pictures. While my camera resolution isn’t the best, there are two people in the photo to the left, and both are taking a picture. I have an extensive shot glass collection at home, and knew I’d be adding a few more pieces from my trip. I try to limit myself to either shot glasses that are especially interesting, or glasses from places neither I nor anyone I know may ever visit again. I felt the VLA fit one if not both of these qualifications and picked up a shot glass from the gift shop. I went to the bathroom and watched as it tumbled out of my purse and smashed into a millions pieces right below the decorative tile art. I went back into the gift shop to buy another, and the woman graciously offered to trade a new one for the broken glass. 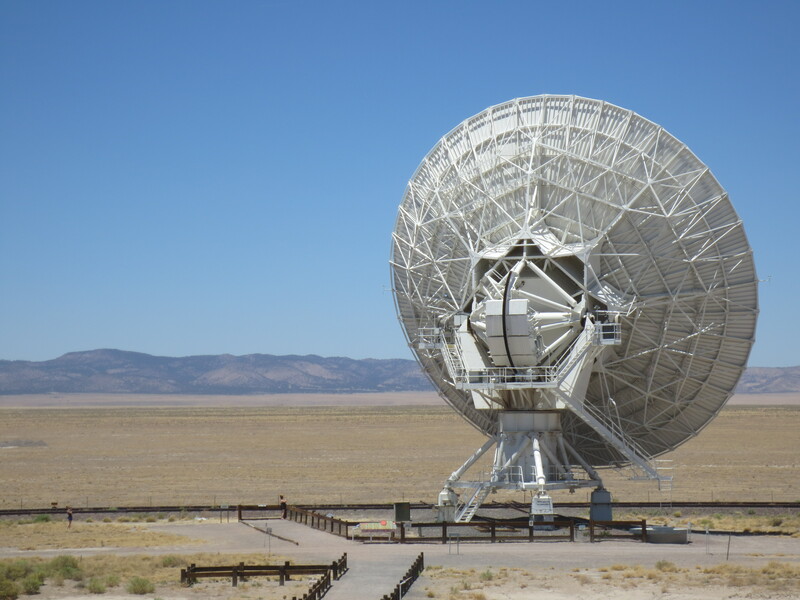 There’s nothing terribly insightful to say about the VLA, though I’m surprised at how many people I’ve met a long the way who’ve never heard of it. I just can’t understand how anyone can get through life without being utterly fascinated by the cosmos. It was around 11AM when I saw the sign for Pie Town. I passed by two restaurants proudly advertising their pies before settling on the Pie-O-Neer. 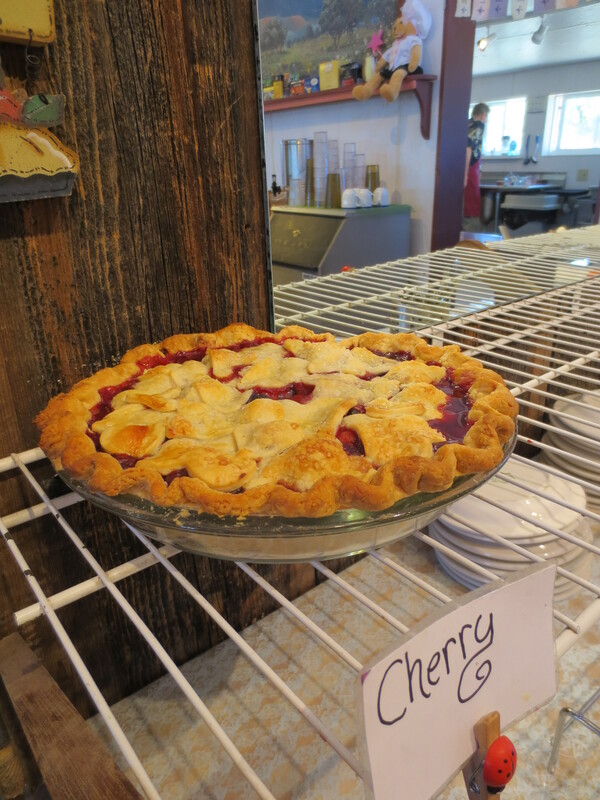 When I walked in the place was empty, and the waitress told me that the first pies were just coming out of the oven, so it would be about fifteen minutes before the cherry pie was ready to be sliced. I told her that was fine, asked for a glass of water, and sat down at one of the many empty tables. A couple in their sixties walked in a moment later. 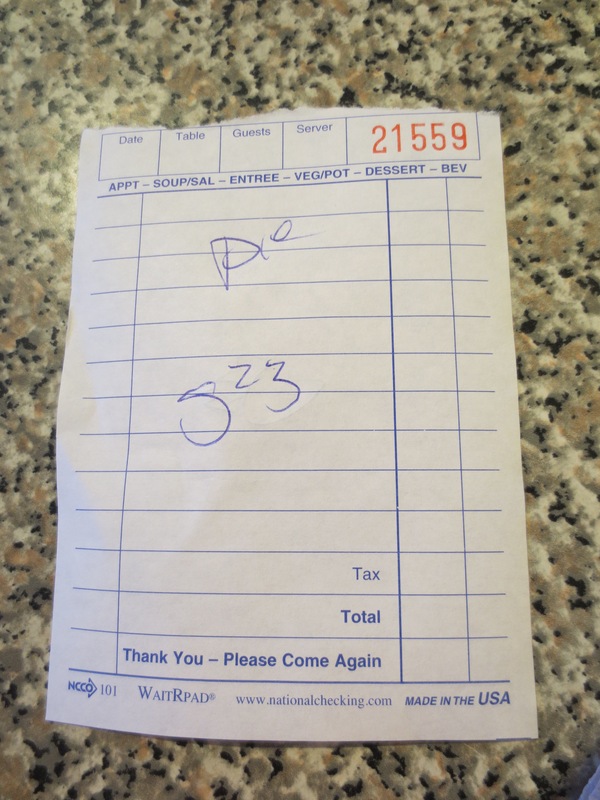 The waitress explained the situation, and the woman looked at her husband. “Well you want a piece of pie, don’t you?” she said as a statement. “Dang straight I want a piece of pie,” he replied with a laugh. The waitress told them they could sit anywhere, to which they replied that they were “counter people.” They always sit at the counter so it’s easy to talk with folks. I moved up to the counter to join them. The baker, a woman named Kathy, came out to apologize for the delay. She said normally they would already have some pies out by now, but she got a late start. “It’s my Monday,” she explained, saying that they always seem to get the pies out late on Thursday mornings. Kathy was dressed in Pink from head to toe. Pink bandana to cover her hair, pink earrings, pink plaid apron, patterned pink pants. She had that slightly frazzled look that old female hippies tend to have. She reminded me of Ms. Frizzle. She kept running in and out of the kitchen to talk with us and check on the pies. Kathy was charming. “It’s a pie quest,” she added quietly. Before they were finished the coconut cream was ready, and the waitress brought me a slice. It is important to clarify something at this time: I don’t like pie. I have never liked pie. I am a cake person. As a sweets-lover I can certainly choke one down if it’s the only available dessert, but I’ve never actively sought out a piece of pie in my entire life. There are three traits of pie that I normally have a problem with: dryness, sweetness, and cohesiveness. Dryness: Pie crusts always seem to be dry and flaky, and they never seem to be very sweet. I often feel like the crust is the forgotten vehicle used to deliver filling. As such, whenever I bite into it I feel like I’m eating a plate. Sweetness: I am rarely one to claim something is “too sweet,” but to me, pie fillings usually are. They are a different kind of sweetness. They are syrupy. I don’t like syrupy. I don’t understand why you would do something like that to perfectly good cherries. Cohesiveness: As a result of the two previously mentioned traits, I often find that the pie, on the whole, doesn’t make sense. In theory having something ovelry sweet next to something bland or bitter is a way of cutting one with the other. It is the basic premise behind High Tea in England. But with pie it never worked that way for me. Instead I just end up with one thing I don’t really like paired with another thing I don’t really like, and they don’t seem to go together. Now, all of that being said: one of the promises I made to myself before I left was that I would take more culinary risks than normal, knowing that the things I don’t like at home might be very different across the country. And, it seemed that if I was ever going to enjoy a piece of pie, it would be in Pie Town. Especially a coconut cream pie fresh out of the oven. It was the best pie of my life. It was the pie that made me finally understand what people mean when they say the crust should be “flaky.” The cream was rich instead of syrupy, and the whole thing made sense. Like it was an actual dessert. A very, very good dessert. It’s been a while since Pie Town, and along the way people have asked me where my favorite place has been thus far. I tell them Pie Town. I have yet to adequately explain Pie Town to anyone, but if I could magically change the next stretch of road on my trip to be momentarily anywhere in the world, I would make it into Pie Town. I suppose it wasn’t just the place itself, but the effect it had on me. That delicious piece of pie was further proof that I should keep being adventurous and try things I don’t think I’ll like. Hearing the Lincoln couple explain that they like to sit at the counter in order to talk to people made me realize that the counter was the best place for me to be if I wanted to meet people on my journey. I haven’t sat at a table alone since. 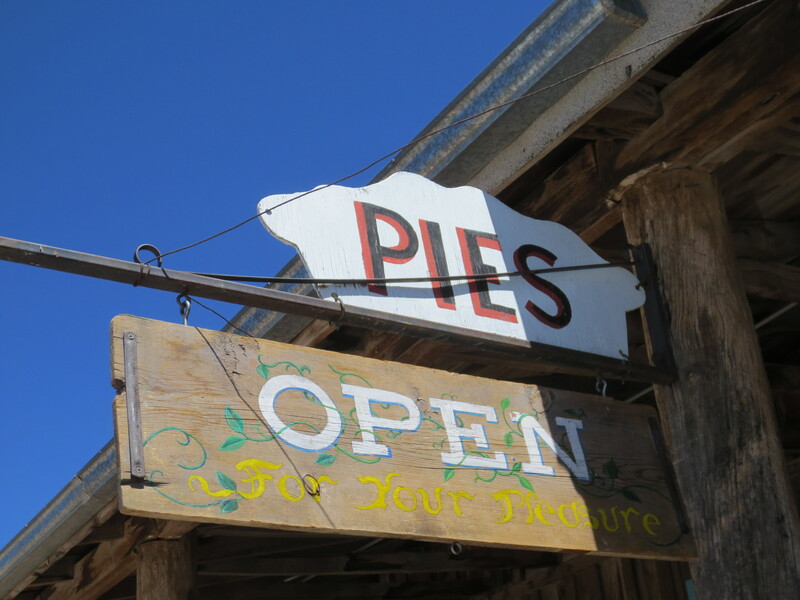 Pie Town was also the turning point in my trip and my life where I began to draw a distinction between the words “highway” and “interstate.” I too prefer highways to interstates, even if it means a longer day. It’s a better day. About an hour before the alarm was set to go off, the temperature finally dropped low enough to make it worthwhile to get halfway into my sleeping bag. We hadn’t eaten all the food allotted for day one, but opted to take all of the extras in our packs rather than stick any in the mule duffle. In our minds it was still possible that we would get halfway up the canyon before one of us would break a leg and we’d need to survive on food ratios for days as we awaited rescue. At least, that’s how I justified bringing twice the recommended amount of food. I don’t know what Nikki was thinking. After a successful breakfast and a slightly late start, we were at the trailhead at 6AM. 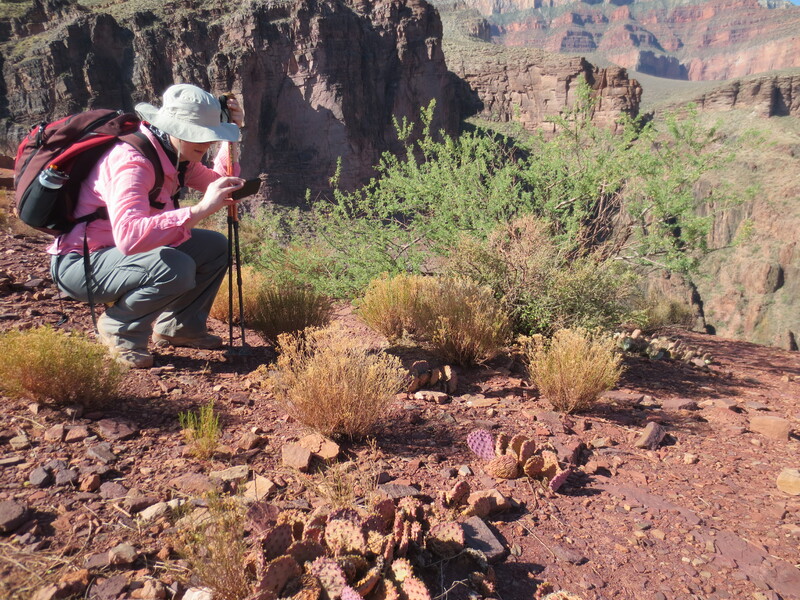 The first 30-60 minutes is spent crossing the river and getting to the lowest point of the Bright Angel Trail on the south side, which means that the map shows no elevation change between the trailhead and the first water stop. There is no net change, but the trail does wander up and down a lot, something neither of us were thrilled with after four hours of straight downhill the day before. When we got to the water stop, we did as instructed: soaked all of our clothes to keep cold, sat in the shade, ate a snack, and drank some water. This process would be repeated more times than I could count. 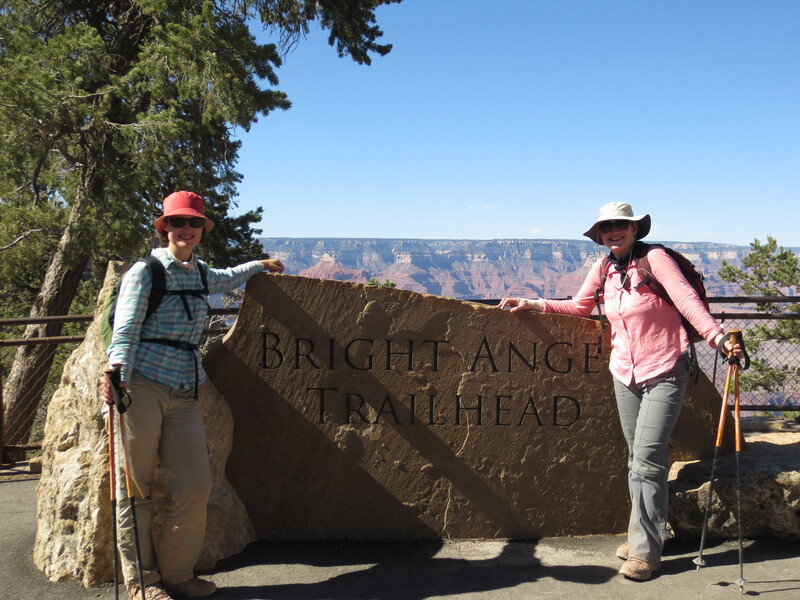 We saw more people in the first two hours on the Bright Angel Trail than we did on the entire Kaibab Trail, which makes sense considering the easier slope, water stops, and outhouses that Bright Angel provides. Stopping so often meant we would pass and get passed by other hikers time and time again. My sister and I can be pretty competitive, if not with each other than with those around us. It was hard being passed by a family with young kids early on, but after a certain point we overtook them and they never caught up again. They may have been full of energy at the start, but kids just don’t have the staying power. Suckers. We made it to Indian Gardens before the heat of the day, as planned. 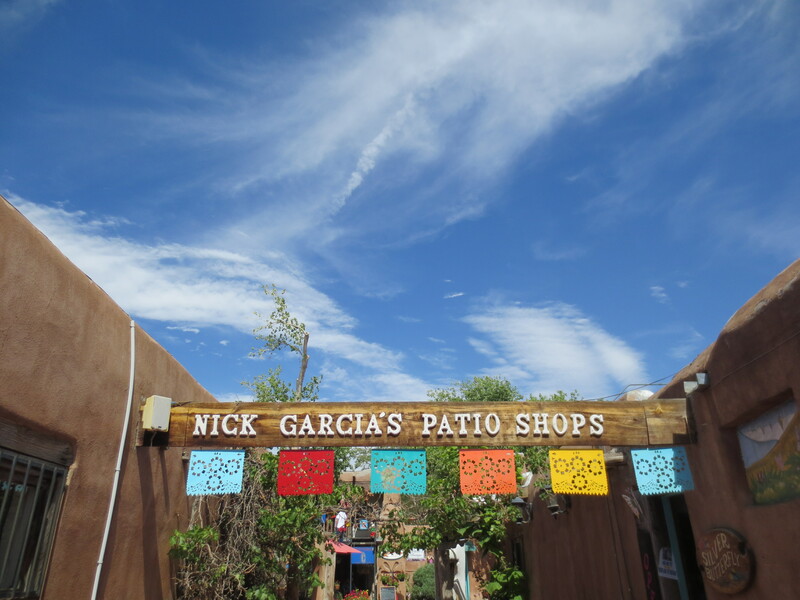 Indian Gardens is an oasis in the canyon, and has been since the earliest canyon tourists. In addition to drinking water and bathrooms, Indian Gardens has a lot of trees for shade. 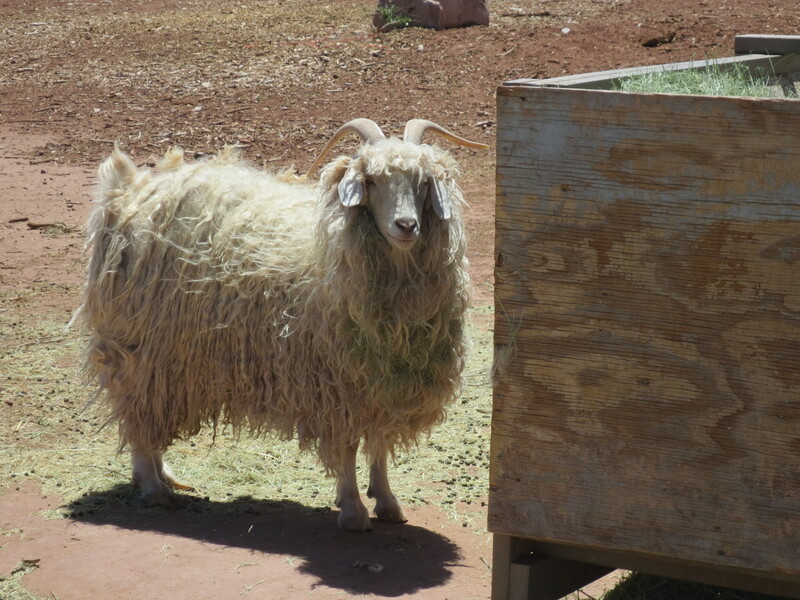 We found a nice picnic table and ate a few choices pieces out of the sack lunches they’d given us at Phantom Ranch. After an hour, Nikki suggested we keep going. It was just after 10AM, the official start of the heat of the day. Absolutely everyone and everything had told us not to hike at this time, save for the one ranger the day before. That ranger said if we felt good and stayed smart, we could hike through the heat of the day. I was hesitant, but Nikki had it in her mind to reach the top before 4PM so we could pick up our duffle before the mule barn closed. I found this idea to be utterly insane, but the first three hours hadn’t been as draining as I had expected, and I did feel fine to keep moving. The worst that could happen (we hoped) was that we’d get worn out and have to wait out the day in a less comfortable and less beautiful spot. We loaded up our water and went for it. We made it about 15-20 minutes before we had to stop. We found a place in the shade to sit, ate a snack, and drank some water. I was concerned about getting stuck, and tried to ration my water a little just in case. We started moving again. We would pass by other hikers, which gave me solace that we weren’t the only ones stupid enough to hike in the middle of the day. Of course, they were all going downhill. We were the only ones dumb enough to go up. Another 15 minutes went by and we stopped again. When you include the breaks, we were going at the speedy pace of 0.5 miles per hour. Of course, the elevation change for every half mile was about 300 feet. Each time we finished our break and stood back up, there was a brief moment where I could feel all the pain in my body at once – the blisters on my feet, my worn out calves, the sore shoulders. For a short second the rest of the journey seemed absolutely impossible in my current state. But I took a few steps, settled my weight back into my feet, and kept going. Nikki led the way most of the time, which was for the best. She could keep a faster pace, and my competitive nature meant I sure as hell wasn’t going to be the one to slow us down. One could argue that because she had been training for a half marathon and doing yoga every day she was in better shape than I was, which is probably true. But I know that wouldn’t have mattered. When Nikki gets it in her mind to do something, no amount of pain or hardship will stop her. When she graduated high school and decided to move to New York City without a job or apartment lined up, almost nobody believed she would make it. They would make well-meaning jokes, saying she would be back home within a month. I knew better, and so did my mother. I suppose because we had both seen what happens when Nikki decides she is going to do something. And this time, Nikki had decided to climb the Grand Canyon. We made it to our next stop, the Three-Mile Rest House, and took another long break. 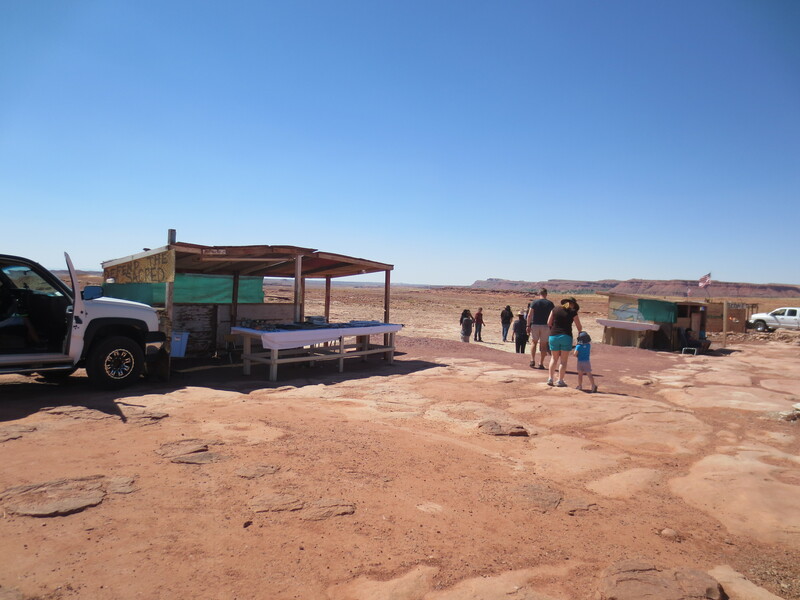 There were a lot of people at the Three-Mile Rest House, since it’s about as far as most rangers would recommend you try to go in a single day. I still had plenty of water, which meant my rationing was unnecessary. I still had plenty of food, but I already knew the amount we took was too much. I kept us at the rest house a little longer than Nikki wanted, because I was still concerned about us being in the sun so much. I was being overly cautious for sure, but it seemed appropriate against Nikki’s overwhelming determination. During one of our shade and food breaks, a man stopped by to chat with us. When we told him we had started our day at the bottom, he pulled back in surprise, “Wow. You guys look fresh.” This was delightful news to us, since we were covered in sweat, dust, and creek water. My shoes were so filthy they’d changed color twice in 36 hours. I think he sensed how surprised we were that we looked good. “Did you see The Frenchman?” he asked. Apparently there was a man from France hiking up from the bottom that day. He didn’t have a real backpacking backpack, so he was carrying his sleeping mat in his hands the whole time. According to our new friend, The Frenchman and his lady looked absolutely ragged. We kept our breakneck 0.5 mile-per-hour pace for the next stretch of trail. 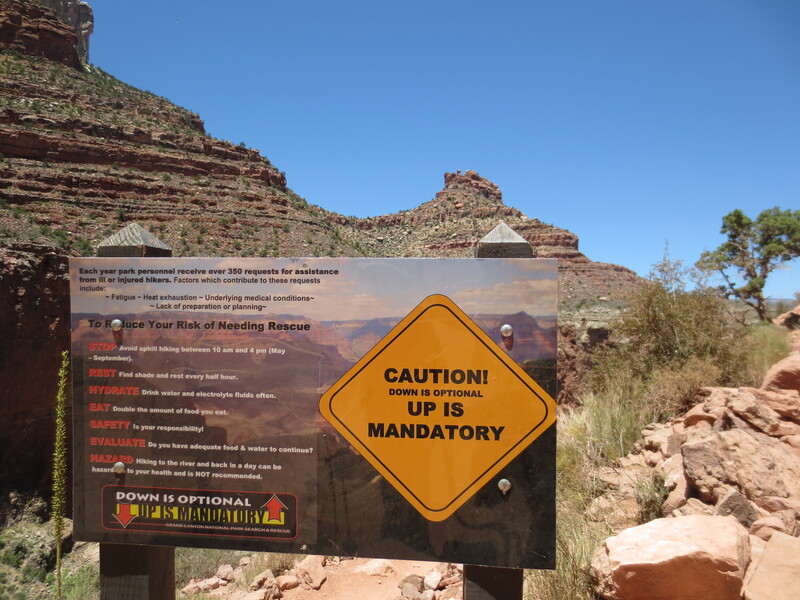 We saw one of my favorite signs in the park, informing the reader that “Down is Optional, UP IS MANDATORY.” The park does a lot to try to discourage people from making bad decisions, a department known in the park service as Preventative Search and Rescue (PSR). 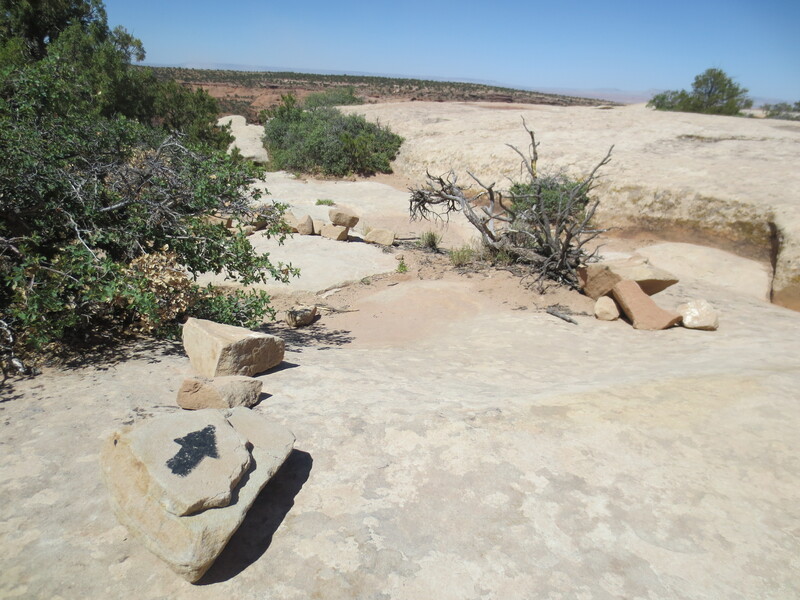 They place signs at key spots where they know people will be when they are about to make a bad decision, such as right before the Three-Mile Rest House, or a few minutes down the South Kaibab trail. 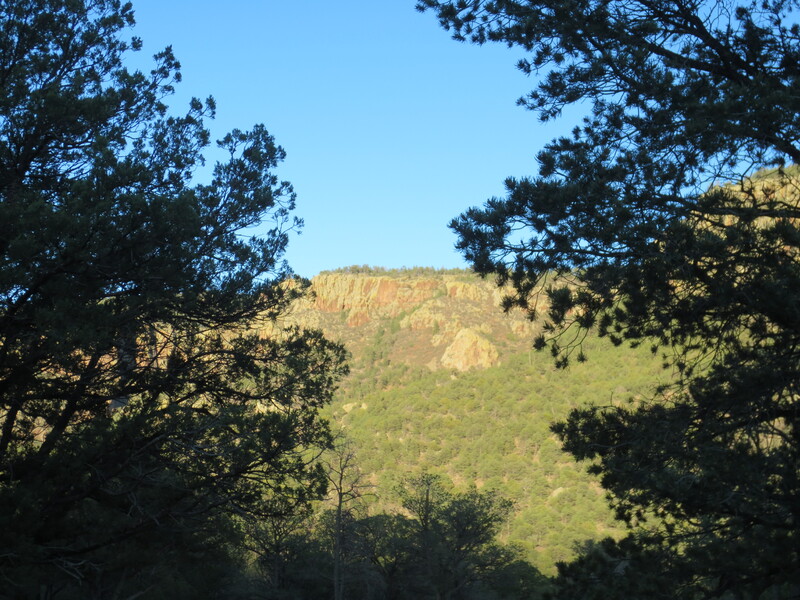 In addition, they have PSR Rangers whose job it is to walk up and down the trails near the top, asking people about their hiking plans and making sure they’re prepared. The PSR Ranger at Three-Mile didn’t ask us anything, probably because she saw we were coming up and not going down (by the time people are walking up, they’ve already made most of their bad decisions). However at the 1 1/2 Mile Rest Stop, a PSR Ranger arrived after we did, and started talking to us as we were filling up our water bottles. “How you doing?” he asked. “Well…” he replied, “It’s a long way up from here.” He was looking at me the way I look at my Sunday School kids when they ask to use the glitter. He told us to be careful because it was hot out, and I tried not to laugh at him. No kidding, I hadn’t noticed. Nikki felt like we hadn’t convinced him. I thought he just wasn’t used to ending encounters without a warning. Despite our confidence after several hours of successful hiking in the heat of the day, we were still a bit nervous. We had been told many times that the hardest part of the hike is the very end. And we still had that coming. To make matters worse, the very end of the hike is also when you start to encounter tourists. It is astounding what some people will do when entering a serious situation with a lighthearted attitude. We would see people walking down in flip-flops, tanks-tops and shorts with no water and without so much as a hat to protect them front the sun. We saw children running so far ahead of their parents that we started to wonder if something had happened to them on the trail and the kids just didn’t notice. 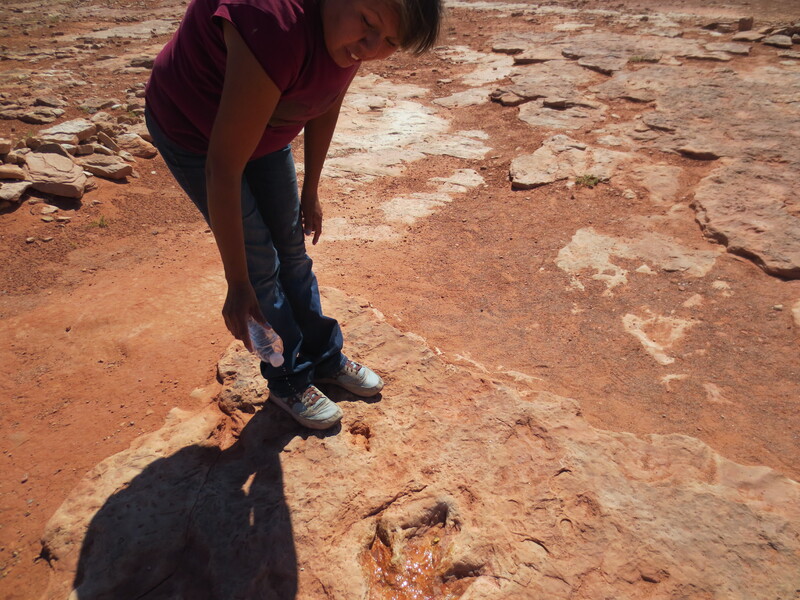 The day before one of the rangers said she once saw a woman on the trails in sparkly high heels trying to feed a granola bar to a rattlesnake. On our way up we overheard a PSR Ranger talking with some women about their hiking plans. The ranger helped them do the math based on the time of day and how long it would take them to get to their destination. “So do you all have flashlights?” she asked. The women stared blankly. “Well,” she continued, “with your current plans it will be dark for the last hour of your hike. If you don’t have flashlights you might want to turn around sooner.” The PSR Ranger passed us and continued up the trail at a speed that would have seemed fast on level ground. Nikki’s competitive instincts kicked in and she immediately sped up. I had to yell up to her to slow down. “She’s a ranger, Nikki, she does this every day. And she didn’t start at the bottom.” Nikki agreed and slowed down, but I could tell she didn’t like it. As we got close to the top, it was emotionally harder to take breaks, even though we knew we had to. 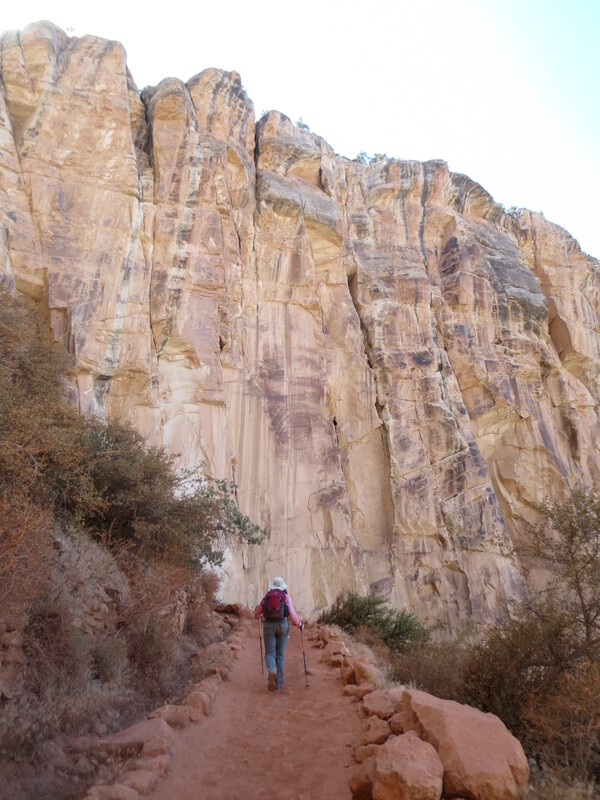 The canyon is deceptive, because the layered ledges make it impossible to see the top for most of the hike up. All you can see is the top of the next level. What’s more, it’s hard to maintain a sense of scale, because you’re not used to being so close to rocks and walls that huge. It’s easy to look up, see a ledge, and think you’re almost there. In reality, you still have 3/4 of a mile to go and it’s time to take a break. As we approached the summit, the people around us became more reckless, worse dressed, much louder, and more numerous. The hiker we met the day before was right: you do start to hate everyone you see. They don’t know what you’ve been through. They won’t be able to handle it. Lucky for us, Nikki still had her Positive Attitude. When we finally reached the top, we hugged and yelled, and asked a woman to take a picture of us in front of the trailhead. She seemed oddly unimpressed with our accomplishment, though at that point everyone seemed to be under-reacting, since I felt they should have been throwing a damn parade. Of course Nikki couldn’t help but point out the time. It was just after 4PM. The walk to the car would take an extra ten minutes, so we wouldn’t get to the mule barn in time, but that didn’t matter. It was 4 o’clock. We had hiked a vertical mile in just over 10 hours, including breaks. It was two hours less than our estimate, and it was exactly when Nikki intended to get to the top. God help us if she ever decides to do anything truly destructive to the world.